In the rush to electrify cars, everyone seems to forget that most of the UK’s electricity is still coal or oil fired. So while pollution from tailpipes in cities is minimal, emissions from power station chimneys are massive. And if you add storage of electricity in batteries, the total CO2 emissions of an electric car are close to those of a diesel. But renewable energy from solar panels, wind farms and hydro generation just isn’t going to make enough juice to keep everyone’s lights on, never mind power 30 million electric cars. The big money is not going into generating electricity, it’s being invested in short-life electric cars and short-life batteries. They talk about "renewable energy" but what they really mean is "renewable cars." That’s the way to make a financial killing. In the meantime, Mazda is looking at all options. Cleanest overall in both NOx and CO2 is an LPG powered hybrid. And there is still considerable room for improvement in internal combustion engines. As part of its Skyactiv-X, the next generation of Skyactiv, Mazda is developing a Spark Controlled Compression Ignition petrol engine. Most of the combustion of the fuel/air is by compression, as in a diesel. But to achieve a stoichiometric ‘lean burn’ air-fuel ratio of 30:1 all the fuel in the combustion chamber needs to burn simultaneously. This is achieved by adding spark ignition. 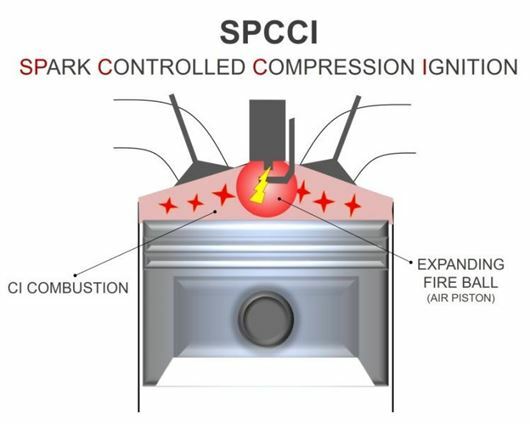 Using Spark Controlled Compression Ignition (SPCCI) means that the range of engine load and rpm where compression ignition can take place now covers the whole combustion range. The potential application of compression ignition has dramatically expanded, allowing this technology to be used in almost all driving conditions. Because a spark plug is now being used at all times, the engine can switch seamlessly between combustion using compression ignition and combustion using spark ignition. The overall effect is a significant improvement in torque in low speed traffic at low engine revs, dramatically improving fuel economy by as much as 35%. Yet also allowing the high revs of a petrol engine. Mazda’s Skyactiv-X programme is also looking at means of improving tyres, suspension, body structure and seat comfort, making the entire package more efficient. Look for the first fruits of these developments in 2 – 3 years time. Pleased to see that Mazda are "looking at means of improving tyres and suspension". They need to! My CX-3 suffers from relentless tyre noise and an unforgiving ride, even on 16 inch wheels, so there is certainly room for improvement. I shall be following HJ's advice and fitting Michelin Cross Climates when the time comes for new tyres. From the look of the design in basic terms and on the surface, it doesn't appear to have solved the problem that all direct injection engines (rather than in the air stream before the intake valve) whereby they get clogged with combustion by-products because, unlike with older fuel injection systems, the fuel doesn't help to wash them off/clean them as it bypasses the back of the valves altogether. This apparently leads to reduced engine efficiency and poor running, requiring expensive cleaning (removal of the valves etc, using 'sprayed in' products in the air intake seem to give poor to average results at best) or complete replacement of the valves, again, expensive, and to me, negating any improvement in mpg, as (again, going on others' reports) it seems to affect cars around the 40k miles mark, not that high. My concern is, that as we've seen with many modern car engine designs, they have been modified to be very efficient on day 1, but compared to previous designs, are significantly more complex and often (especially modern diesels) are far more prone to premature wear and tear/significant reliability issues in a relatively short timeframe (especially when mainly used for short and/or urban journeys) compared to designs from the mid 1990s to mid 2000s. Mazda will need to be careful to avoid the significant reliabilty issues that have been associated in the media with their (bought-in) diesel engines, given they have got a good repuation for reliability in their petrol ones, but don't have the financial clout of the really big names to survive a 'dieselgate' or suchlike if their apparent diesel woes extend to their petrol engined cars. I hope they do get it right, as a) I am a (satisfied) Mazda car owner of several years and b) find their approach to car design refreshing in a world that has made many boring and staid. So many inaccuracies in those 4 paragraphs below the photo it's difficult to know where to start. "So while pollution from tailpipes in cities is minimal".. Really? Walked along Farringdon Rd in London recently?? Visible smog you can taste... "the total CO2 emissions of an electric car are close to those of a diesel" Wrong. 2 recent scientific studies showing less than 50% whole life emissions. "Short-life electric car" What exactly is that?? Plenty of 10yr old priuses running around with batteries that are just fine. Almost no reported instances of battery failure in EVs. And as you point out yourself, much less to go wrong with an EV due to lack of moving parts, so logic says an EV will last a lot longer. Speaking as someone who has just had to scrap an otherwise decent Saab due to gearbox failure. Swap the battery out when it fails & the old one gets recycled. Older Priuses aren't EVs - they are hybrids which still mainly use the IC engine to power them, and only a small amount of the electricity generated from regen braking goes to actually powere the car (and for only a few miles). It should also be noted that the economic life of the batteries in such cars is ONLY 7 years, as by then (like ALL batteries) they don't hold anywhere near as much charge as on day 1 (probably well under 50%), meaning their electric range is halved and they use the IC engine more. A 10yo Prius is effectively a heavy (batteries) small engined petrol car with a bit of battery power for 5-10 miles tops. Just because the batteries are still working doesn't mean they doing so efficiently. Even the manufacturers admit this. There is something to be said for the reliability of the engines as you stated, as evidence suggests they (Priuses, not sure about other makes to Lexus/Toyota) are by far the most reliable cars on the road at the moment. The other problem with EVs/hybrids is the what the batteries are made of and how these materials are originally sought and, at the end of the battery's life, dealt with. Quite a number of battery components are very difficult to get hold of as they are VERY rare elements (e.g. Lithium, which, despiet recent new finds, is a very scarce and dwlindling resource because of extra demand from EVs and mobile phones/computer devices) and require a LOT of processing (as well as the large amount of CO2 used to mine and ship them to plants), plus it isn't easy/efficient to recycle such components. Many batteries in such cars use toxic materials that cannot be recycled and are VERY harmful to the environment. The problem has always been that EVs are great for air quality in urban areas, but at the cost of the above and the extra electricity they consume (at only 30% efficiency before it gets to the car due to generation effecticies and transmission losses), which then transfers the pollution to rural areas where the power stations are. Hopefully as new materials and manufacturing designs/techniques are found and power can be generated and store more efficienctly, EVs will become the norm. I think, as long as Mazda can overcome the reliability isses of GDI engines and of this new tech, then this will be a good interim measure for the next 20 years or so alongside the developing EV market - it can also go alongside it with hybrids, something that Mazda are apparently planning to do around the same time as this IC engine's introduction. Thanks. Yep I understand Prius is hybrid not EV. But that's really the only long-term vehicle battery reliabiity data we have. This site batteryuniversity.com/learn/article/availability_o...m says the lithium "supply is ample and concerns of global shortages are speculative". I'm no expert. My prediction. EVs will be 80% market share by 2025. By then you'll be generating your own power and storing it in house batteries. Already cheaper to do this in some parts of the world than buying off the grid. View Tony Seba (Stanford Uni) on YouTube if you want to find out what will happen. I wouldn't put much faith in that article, given its (in my opinion) probably either sponsored by a battery manufacturer or financed by some person/organisation with some vested interest in battery technology - I mean, come on: 'battery university'! Anyway, don't forget that, worldwide, the number of battery-powered cars (not including old-style lead acid batteries in standard cars) - EVs and hybrids, only accounts for a VERY small percentage of all cars on the road today AND even new sales. Yes, that is increasing, but as I said before, most lithium today is used in very small capacity batteries (relative to those used in vehicles) in phones, tablet PCs & laptops, watches/timers and hearing aids, amongst other things (including ordinary batteries - mostly high drain use in cameras of all sorts). Just imagine if, say, just 10% of ALL cars were to go FULLY EV and see how much battery power that would need, then equate that into how much lithium would be needed to satisfy that. As I said before, lithium is apparently difficult to reclaim (for recycling into the next generation of batteries) from used up batteries, hence why it will, like oil and gas, eventually run out, and according to some reports, within 50 years. A new source for the high use battery would then be needed, which has yet to be found. I think IC and diesel engines still have some life left, though I do suspect we'll have to go part way to EV by increasing use of hybrids in urban areas to reduce harmful exhaust fumes, as long as we can generate electricity more efficiently and greener and transmit it with less losses than now (see earlier posts). It may also be a good time for policy-makers to think more about designing cities/towns so that we don't need to rely on road transport so much - many of use increasingly commute further and further to work, mainly because of exhorbitant house prices in larger urban centres and a lack of supply (an issue for another day/thread!). Electric vehicles may cut pollution in the immediate vicinity of their use, but in most cases, they will be charged by burning fossil fuels. Since the power that gets to your home is typically around 50% of the energy value of the fuel burnt at the power station and charging and discharging batteries uses even more of the energy value in the fuel, it's difficult to see how battery power can be the long term answer. Just imagine how many more power stations and grid systems would need to be built if we all came home from work and plugged in our cars for a charge up? I think small high-efficiency engines have a long way to go yet. You may find this is due to the specific tyres fitted, though I'm surprised at this happening on a non-Sport model from the CX-3 range with the 205/60 R16 rims fitted (same as on the Mazda3 up to the SE-L Nav) which seemed fine to me when I test drove them both, even the CX-3 Sport on 18in rims was ok, but it was a brand new car. I found that on my Mazda3 mk1 (2005 build), the OEM Bridgestone tyres were poor after a couple of years and dreadful after a couple more even though they were wearing well (down to 4mm tread after 6.5 years/40k+ miles). I think the tyres you've got on your CX-3 are Toyos. I changed my Bridgestones to Dumlop SP Sport FastResponse (the current Blu versions seem to be even better, similar to their cousins from Goodyear which get excellent reviews). I would check the Tyrereviews.co.uk website first for reviews (by tyre size to match yours exactly or even by car [you may find an exact match, and it includes driving style and miles/km covered]) to find a good compromise between tyre wear (hard tyres last but give a poor ride and aren't good in the wet, soft ones don't last so long but give a better ride and grip better) and handling. Don't bother about reviews from people who obviously own modded cars or (unless you do) their driving style is at the opposite end of the scale to you as this will, especially on tyre life and grip, give a false result. May also be worth checking to see if your tyres have been fitted the right way around, as those may be either directional or asymmetric and must be fitted at the correct side/corner - if they're not, then they could be noisier and give less grip in the wet. If I keep my 3, I may change my tyres to the CCs if they are not too expensive (expect a minimum of a 15% premium for them over other 'summer tyres', and note that your 205/60 R16s are not the most popular 16in tyre (my 55 profiles are) and will be about 20% more than the most popular. I checked when I was looking to replace my 3 earlier this year and the 205/60 R16s came in at around £75-£80 each (fitted) for normal ones and around the £100 mark for the CCs. If you live in a rural area and/or get a reasonable amount of snow each year, then the CCs might be worth a punt to get better grip in the winter. If its a really rural are and it snows a lot (Scotland, Wales, north of England) than I'd rather get a summer set on the OEM alloys, and a (f possible) higher profile full winter set with their own steel rims which will grip better in ice/snow/mud and can be stored (if you have one) in your garage during the other half of the year. Not entirely accurate, on the electricity front. Coal is dropping rapidly, oil is non-existent, and gas does the heavy-lifting. Despite that, the carbon factor of the grid has nearly halved in 10-15 years, which is impressive. So electric cars are automatically getting cleaner all the time! Of all the fossil fuels, gas is the one will run out the quickest, precisely because governments like the UK are using it to have an 'easy win' on the CO2 emissions front without changing how we do much else in society. All this means, given the dwindling supplies in the North Sea, overblown fracking capacity in the UK and politics around the world, that we would be relying on imports from the US (who are now thinking of themselves first and other countries a distant second) and especially Russia (enough said), whereby prices will inevitably rise by several magnitues in the next 25+ years. Don't forget we are nearly at peak gas usage in the UK already, so more improvements in CO2 emissions without going to nuclear in a big way (which, given recently news items in that area, is some way off and will be relying on unreliable designs and the finances.build under the control of the communist Chinese government). Nice. In addition, little improvements have been made in the last 20+ years in the efficiency of the transmission of electricty, as I stated earlier. Its actually more efficient to have gas pumped to you home to a CHP unit to generate electricity and heat it than to hav a standard gas boiler and power from the grid, let alone an electrically powered and heated home from the grid. With cars, whilst battery tech is improving, it still is some way off providing a useful alternative to IC engined cars (and especially commercial vehicles) for higher usage than a few thousand miles a year in urban areas. See also my comments about batteries in other replies. Yes, EV cars are getting cheaper, but a) that's not saying much, given they are still roughly 50% to 100% more than equivalent specced IC engined ones, and still have, over (say) a 15 year lifespan nowhere near the range (especially from year 3-7 [7 years if the max useful life of the batteries, even according to the manufacturers] when the range significantly drops off) and reduces in older age - something than doesn't occur in older IC engined cars. It is true that they require less maintenance, though I suspect that this will keep prices high as that's where most dealerships make money nowadays, and getting rid of maintenenace business will just cause many to go under if new prices for EV cars came down to that of IC engined ones. Pardon my intrusion, but you seem to be falling for one of the most common fallacies concerning electric cars (and power generation in general), which is that everything will always be exactly the same as it is now, and that it's sound reasoning to extrapolate from today's technology to dates a couple of decades away. But in fact, we can reasonably expect battery technology to develop considerably over the next few years, and we will see lighter, cheaper batteries with much greater storage density, probably using materials other than lithium. Improvements in battery technology will also increase the value and utility of solar and wind power, as it becomes more practical and economical to store energy that is surplus at the moment of generation for use when it's needed. I found this BBC report from the 8th June 2017 both interesting and a cause for optimism: "National Grid reported that, on Wednesday lunchtime, power from wind, solar, hydro and wood pellet burning supplied 50.7% of UK energy. Add in nuclear, and by 2pm low carbon sources were producing 72.1% of electricity in Great Britain." Those figures you produce for 'green' energy are just a snapshot at a time of year that wind energy especially is high (for obvious reasons). For much of the year, it is well below that (sun not shining strongly/often enough or wind blowing, often in winter), and, because wind turbines are quite high-maintenance devices, they (or major components, such as gearboxes) need to be replaced more often than you think, and much of the parts are sourced (materials) from other countries which don't have anywhere as good 'green' technology. I agree that things are imporving, but not to the extent that EVs can suddenly 'take over' from IC engined vehicles and all our energy and pollution problems will be over. At the moment all they are doing is exporting pollution from one place to another and reducing the buffer of electricity we produce, hence why several reports have highlighted why we could be facing power cuts because of extra electricity demand and falling generation due to phasing out of oil, coal as fuel sources, gas becoming more scarce (and thus getting more expensive at a rate well above inflation or relying on Russia) and successive governments (especially the NuLab ones) delaying decisions on replacing worn out nuclear power stations. We should be realistic, but also spend money better insulating buildings of all types, reducing energy wasted in other areas and making society use it more efficiently. Wood pellets are shipped from all over the world by ships burning filthy bunker oil. Saw a link in NZ from Mazda suggesting that an all electric Mazda3 that runs on electricity made from burning gas puts out 100g/km CO2, the petrol Skyaktiv 10 115g/km; if coal is burnt to make the electricity about 200 g/km, which, which is way worse than the current standard 2.0 petrol. It is a very good idea to bring in new innovation into motoring. Electric cars do have disadvantages e.g. mileage limitaion, charging point limitaion, battery costs etc. The thing that I will be watching will be the cost of the cars with such engines. I remember w***el engine had a huge upsurge in the press with fantastic reports of economy, efficiency, up to date technology etc. etc. What happened to all that hype? Is Spark Assisted Compression Ignition engine likely to follow the same path? Only time will tell. On paper at least it sounds a very good idea if it can be achieved with the customers wallet size in mind.